I took my first Nia class at a local fitness club in the spring of 1999. At the time, I was a self-employed in the retail coffee business~ yes, whipping up the daily espresso, managing staff & using caffeine as an energy source. I was also completely bored with my workout routine: treadmill walking, “light weights” & a little yoga—am & pm. It was just enough to keep the aches, stress and tiredness at bay. A friend thought I might like Nia-that it wasn’t like the run of the mill group exercise classes and that I would have fun. Yeah, yeah, yeah, I could use some fun! I remember arriving early, witnessed the instructor spring joyfully across the room and thought to myself, “I want some of that.” I wanted to be present, to have energy & to exude the power of living in my body. What followed was a fitness experience filled with fun, joy, and a sense of freedom that reminded me of childhood, of being in the moment and having all day to play. That experience kept me coming back no matter how tired I was, how early the classes were (6 am) or how uncoordinated I felt. By the end of every class my body felt better, my mind clearer and emotionally that “Nia High” carried me through my day. I began listening to my body. I stopped searching for the how or why of being stuck in a feedback loop of pain that affected the connective tissue of my body (elbows, forearms, wrists, plantar fascia and hamstrings), the repetitive stress, disrupted sleep, fatigue, hormonal imbalances, and food intolerances. THE STRESS! I even had a doctor of physical medicine tell me I was on my way to Fibromyalgia…I replied that I was most likely on my way back!! I chose to focus on what made me feel better, the sensation of wellness. It resulted in better nutritional choices as well as letting go of relationships that drained me of energy. As a practice, Nia is done barefoot to stimulate the 7000 nerve endings in the feet and to provide sensory feedback. In my story, I wore shoes for 3 years to support my foot & manage fascia and heel pain. I discovered that movement was the key to my health—a moderate amount of movement or the “Goldilocks of movement.” Nia is movement guided by sensation. Nia is moving with purpose. As my feet strengthened, the shoes came off—ahhhh. I learned to accept that my fitness level (& energy level) was different each day. Nia provided me the tools to personalize my movement relative to how my body was feeling in the “now.” I, the collegiate athlete, had to listen to my body and through awareness explore a range of movement and level of intensity that was right for My Body’s Way. My body began to heal. I became more flexible, supple, and no longer had to rely on massage therapy, chiropractic care or acupuncture to release muscle tension. My endurance and energy levels increased. I fell in love with this sense of connectedness as my movements became more integrated and fluid—“dance-like.” I was having fun! Nothing boring about it! In 2003, I changed my life. I’d had enough. I put my life coaching tools into action. I sold my retail business and set my mind on exploring the healing arts. 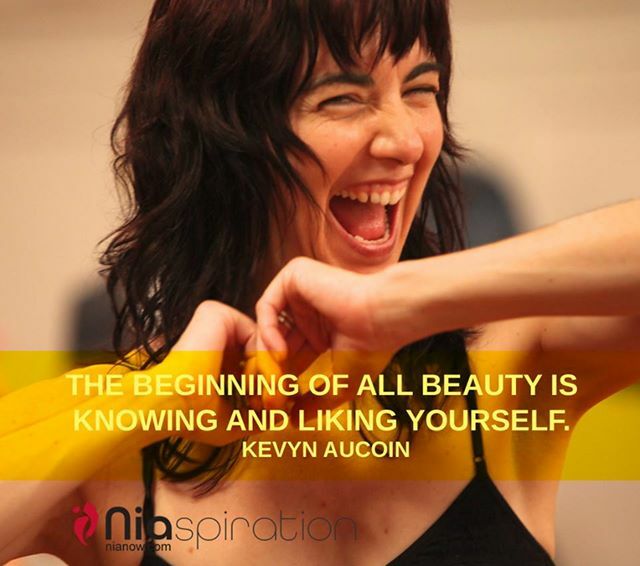 I trained as a yoga instructor (my other passion at the time) and in October of 2003, I took my first Nia Intensive and began Dancing Through Life as a licensed Nia Teacher. I got myself “some of that” and so much more! I started teaching in the Spring of 2004, adding classes to my schedule and progressing through the Nia belt levels as my vitality increased. Living near Portland, location to Nia Headquarters, is a great advantage. I have the opportunity to study with Nia co-founders, Debbie Rosas and Carlos AyaRosas, experiencing the sheer pleasure of their mastery. I consider it an honor to “teach for my teachers” and am now a member of the Nia Training Faculty. Nia 5 Stages ~ Minful, self-healing practice based on the stages of development. I am grateful for the role Nia has played in my life: Thank you, Nia, for enlivening my body, conditioning my mind, empowering me to positive choices and cultivating my expressiveness. I love sharing my passion, for inspiring and empowering every body I meet, dance with and teach to choose the path of pleasure, to step onto a journey of self-discovery through The Joy of Movement.